This macaroni and cheese recipe is a combination of elbow macaroni and a flavorful homemade cheese sauce. Some American (Velveeta) cheese in the sauce makes it creamier than all cheddar, or use all cheddar cheese, smoked cheddar, or a cheddar and Gruyere blend. The sauce is made richer with some light cream or half-and-half, and a small amount of mustard adds flavor. The buttery bread crumb topping browns perfectly for a delicious, crunchy topping. I sometimes add grated Parmesan cheese to the bread crumb mixture. Grease a 2-quart baking dish or spray with cooking oil spray. Cook the macaroni following package directions; drain in a colander and rinse with hot water. In a bowl, combine the cheddar and American cheeses. Set aside. In a medium saucepan melt the 4 tablespoons of butter over medium heat until hot and foamy; stir in the flour until bubbly. Cook, stirring, for 2 minutes. Gradually add the milk and cream along with the salt, pepper, and ground mustard. Cook, stirring constantly, until thickened. Add 2 cups of the cheese blend and continue cooking until melted, stirring constantly. Melt the remaining 2 tablespoons of butter and toss with the breadcrumbs. Sprinkle over the cheese layer. *Make breadcrumbs in the food processor using day-old bread or rolls. Use a combination of cheddar and Gruyere cheese or all cheddar cheese. Use shredded smoked cheddar cheese in the sauce. Add about 1/2 cup of cooked crumbled bacon to the sauce. Add 1/4 cup of grated Parmesan cheese to the bread crumb and butter mixture. Basic Layered Macaroni and Cheese Bake - Just 5 ingredients go into this easy mac and cheese. Baked Macaroni and Cheese With Sausage - Browned sausage is added to this baked macaroni and cheese. Macaroni and Cheese with Bacon - Crumbled bacon and bread crumbs top this macaroni and cheese casserole. 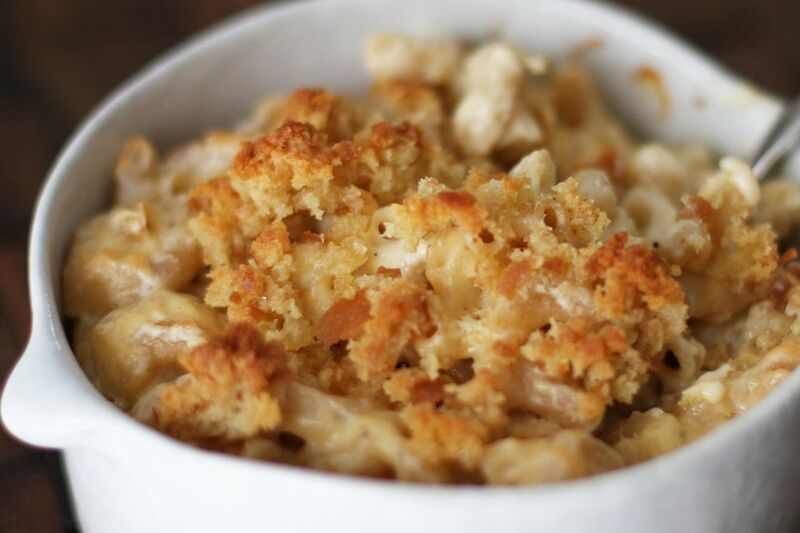 Slow Cooker Macaroni and Cheese With Variations - This macaroni and cheese is cooked in the crock pot.